For the last couple of years, manufacturers have been striving to make their TVs look wider, flatter, and slimmer--in short, more like plasmas. The all-picture style is alive and well with the Hitachi 50VS810, which looks, from the front at least, almost exactly the same as the company's plasma sets. Go around to the side, however, and you'll see it's not exactly ready for wall mounting. While we loved its classy look and boatloads of features, its image quality, while very good, doesn't quite match that of competing microdisplays. That said, its excellent out-of-the-box settings will definitely appeal to people who don't want to spring for professional calibration, especially those who see rainbows with DLP sets. The Hitachi 50VS810 offers similar performance to that of the 50V500 from last year, although the new reflective screen does hamper image fidelity when the lights are on. The VS810's main strengths are excellent out-of the-box settings (its precalibration picture is much more accurate than that of the Sony KDF-50WE655, for example) and plenty of control over the picture. Its weaknesses, especially compared to competing DLP-based sets such as the Samsung HL-P5085W, are lighter blacks and the screen-door effect. DLP technology, in particular, has improved since last year, so we gave the VS810 a lower performance mark than we did its predecessor. When sitting closer than about eight feet to the 50VS810, we noticed signs of a screen-door effect--the result of being able to discern the spaces between pixels. For example, when the crew was exploring the planet's surface, what looked like a very faint grid appeared over the flashlight-lit background behind Captain Dallas. We didn't notice the grid from further back, and neither the JVC HD-52Z525 nor the Samsung evinced this effect. A couple of other differences emerged when we compared the Hitachi to the JVC and the Samsung. The 50VS810 displayed less color uniformity across the screen. For example, we saw very faint discolorations in shots of cloudy skies. And while the Hitachi's geometry and convergence were excellent, with straighter lines than the other sets' and none of the fringing that marred the JVC's picture--we noticed that the entire image shrank and expanded as the picture content changed from light to dark and back. Bright areas left curious afterimages; for example, the cloudy ball from the THX intro left a reddish spot against the black background after it exploded. HDTV looked excellent overall, with great detail and color saturation. When we watched the montage of images from the Digital Video Essentials DVD via 720p, we enjoyed superb color in the garish clothes of some frolicking kids and could see every link in a chain on a ferry across New York Harbor. With both HDMI and component video, our Accupel signal generator indicated that the set resolved more detail than the Samsung at 720p and 1080i and about as much as the JVC. 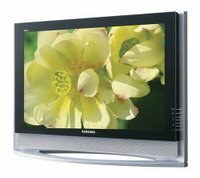 Samsung is among the leaders in flat-panel computer monitors, and it's making a big push to topple Sharp in the flat-panel LCD TV market, too. The LT-P326W is a significant threat to Sharp's industry-leading LC-32GD4U, and although its image quality isn't quite as good, it offers a wider connectivity suite and slicker styling. If price is your first concern, you'll probably be happier with a no-name 32-inch set such as the Olevia LT32HV or the Kreisen KR-320T. This Samsung strikes a happy price medium between those sets and the Sharp, although we do wish it cost a couple hundred dollars less. This 32-inch Samsung produces good-quality images for a flat-panel LCD, but it's not up to the level of Sharp's sets yet. Out of the box, the Movie preset and Warm color-temperature setting resulted in a fairly accurate home-theater picture. We calibrated the set and achieved a more accurate picture, naturally, but we couldn't compensate for the greenish darker areas completely. The rest of the grayscale was reasonably consistent. The Samsung was able to get slightly darker overall than the Philips 32PF9996 we compared it to, with inkier letterbox bars and deeper shadows. But its shadow detail wasn't quite as good as that of the Philips. As Peter climbs the stairs to his run-down apartment, we could make out the lapels of his jacket on the Philips; on the Samsung, they were lost in shadow. Naturally, the Sony tube delivered superior shadow detail and black levels compared to either LCD. As expected, HDTV via our DirecTV feed had even better detail and looked more saturated. We watched a little of Sunrise Earth on Discovery HD and noticed immediately that the Samsung did a good job of keeping video noise to a minimum. In one shot of a foggy morning in the Grand Tetons, the Dell W3000 and the Philips 32-inch LCD both introduced significantly more snowy interference in the trees. The Samsung delivered very good resolution in 1080i mode compared to the Philips; conversely, its 720p picture via component video looked a bit softer. As with most such sets, the Samsung delivered a slightly sharper picture via its digital inputs than via component video. Strangely, however, the DVI input looked even sharper with high-def than did the HDMI input, while the difference between component and HDMI wasn't as great. As a result, we'd recommend using the DVI input for high-def. Rich colors, bright images, and good detail helped the 42PF9966/37 earn the second-highest overall score in our jury tests of eight plasma TVs. We awarded it top marks for color quality and its ability to display both standard definition TV and DVDs. Despite its high display performance, however, this Philips has a few quirks. For starters, it's fussy about input formats. Using both 1080i and 480p input over HDMI, the TV struggled to display so-called multiburst patterns--diagnostic screens from the Avia Pro DVD kit that are designed for testing TVs. The multibursts feature six swaths of parallel vertical lines that become progressively finer from the left to the right of the screen. Most TVs could resolve all the groups, or at least all but the far-right group, which sometimes blurred out. But on this TV, image quality started breaking down at the first group on some screens, and the far-right swath often looked like a swarm of mosquitoes. And in one of our HD test clips from a classic car show, we saw an artificial shimmering effect in the chrome bars of a sports car. Overall, though, our jury noticed no significant problems with the HDTV and DVD content in our test suite. The TV did display a multiburst perfectly in the 720p format. Unlike any other TVs we reviewed, the Philips displays this format with its native 720 lines. Other TVs "upscale" the content by inserting additional pixels to fill the screen to the edges. But on the Philips, 720p images appear with a black border on the top and the bottom, as well as on both sides (in order to maintain the aspect ratio). The audio system, with twin 15-watt speaker units, sounded clean, though not as full as on the rival LG 42PX4D. We especially liked the five-band equalizer, which allows more meaningful adjustments than the simple bass and treble controls on most TVs. In addition, the 42PF9966/37 provides four preset audio modes. The Philips model's most unusual feature is its Ambilight system, which illuminates the wall behind the TV. The Ambilight throws "bias lighting" behind the set; videophiles recommend bias lighting as a method for reducing eyestrain in a dark room. Without it, so goes the theory, the iris must expand and contract rapidly in reaction to the changing brightness level of the video. Some eye experts discount the eyestrain theory, saying that the eye can easily adjust to brightness fluctuations without experiencing strain. But regardless of the science, we found the Ambilight experience pleasant. A dark room seemed less confining with the mild glow around the set, and glancing away from and then back to the screen had a less jarring effect. In addition to providing several fixed shades, Ambilight can adjust its color and brightness to match the material on screen. Users who don't enjoy the Ambilight feature can disable it. The list of remaining amenities is scant. The 42PF9966/37 has an integrated NTSC tuner for standard-definition analog broadcasts, but it lacks an ATSC tuner for receiving over-the-air or cable-based digital signals. You'll need a separate receiver for digital cable or for HDTV. The unit has only one HDMI input, too, so you won't get top quality for more than one video source; you have to use the two analog component sets for other devices. You can custom calibrate for each video input, but for only one set of lighting conditions, as the other five video modes are not user adjustable. However, the set does have a sensor that it can use to adjust the screen to match the ambient room light. Upshot: The 42PF9966/37 offers very high overall picture quality at a relatively low price. But it would be more appealing with an HD tuner and an extra digital video input. Our judges especially noted its timid color and soft details. When calibrating the Sony, we chose its "Pro" image preset as the best match for our criteria. But muted color appeared to be a characteristic of that setting. So we also tried shifting to the "Standard" preset and pushing up the color level to better match the other TVs. But pushing the color much higher mainly served to reduce accuracy by introducing an orangey glow. 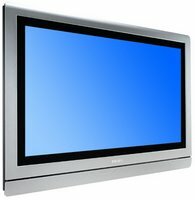 We've been fans of Panasonic's "industrial" plasmas since they were first introduced, and we're not the only ones. These bare-bones, all-picture plasmas consistently top the most-popular lists of online plasma retailers because they don't make you pay for stuff you (as an enthusiast) won't use: namely speakers, a tuner, a gaggle of inputs, and a fancy remote. 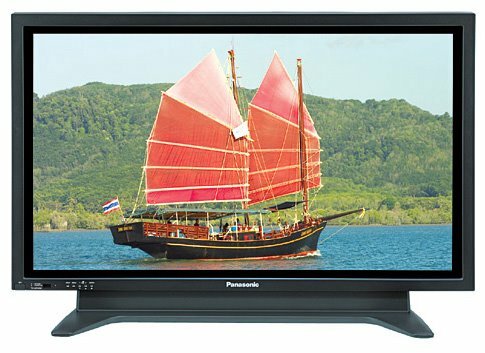 The TH-42PHD7UY, Panasonic's latest 42-inch high-resolution industrial plasma panel, has a picture that's head and shoulders above its "consumer" 42-inch cousins, such as the TH-42PX25U/P, and demonstrably better than virtually all of its competition in the 42-inch size category. 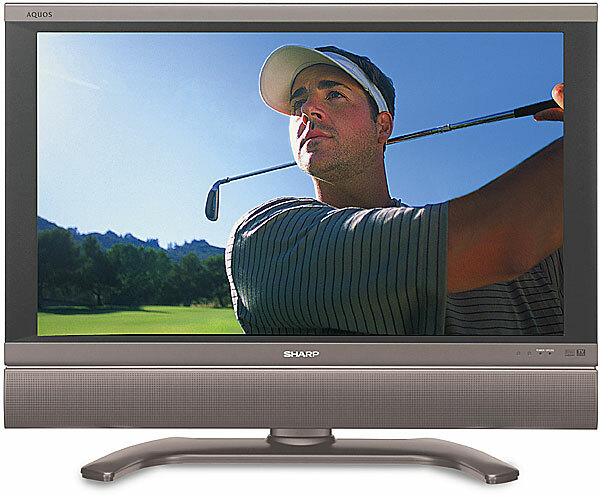 We say "high-resolution" because despite having more pixels than the otherwise-identical EDTV TH-42PWD7UY, this plasma doesn't have enough resolution to display every pixel of true HDTV (then again, no other 42-incher does). If you can get over the lack of inputs and add-ons, the TH-42PHD7UY is hands down the best value in high-resolution 42-inch flat-panel TVs. Like its smaller cousin, this 37-incher boasts a full-fledged feature set, a slick design, and solid performance, including nice deep blacks (for an LCD) and clean video processing. All of that helps make the latest Aquos a tempting target for high-end LCD shoppers, but bargain-hunters and people who prize home-theater image quality will likely opt for plasma at this screen size. Though it takes away from the wide-screen feel, this Sharp's bottom-mounted speaker enclosure will help the panel fit into a narrower entertainment center opening (it measures about 37 inches wide). The company also sells an identical version with side-mounted speakers, model LC-37D5U, for those who prefer the wider look. At about 4 inches on each side of the screen, the two-tone silver-and-black bezel can't be called small, but it is tasteful, nonetheless. Unlike some panels with their absurd backlit logos, the LC-37D7U's understated facade is broken only by two small indicator lights in the lower-right corner. The power, input, channel up/down, and volume up/down buttons are located on top of the panel, tucked into its 4-inch depth. The unit rotates on the included stand but does not tilt, and of course numerous wall-mount options are available. The large remote, which is very similar to last year's model, is backlit and comfortable to hold. Unfortunately, some or the buttons hide underneath a flip-up panel, and while many were easy to reach, a few, such as the illumination key, were a bit more awkward. A side-mounted button would've been great for illumination. 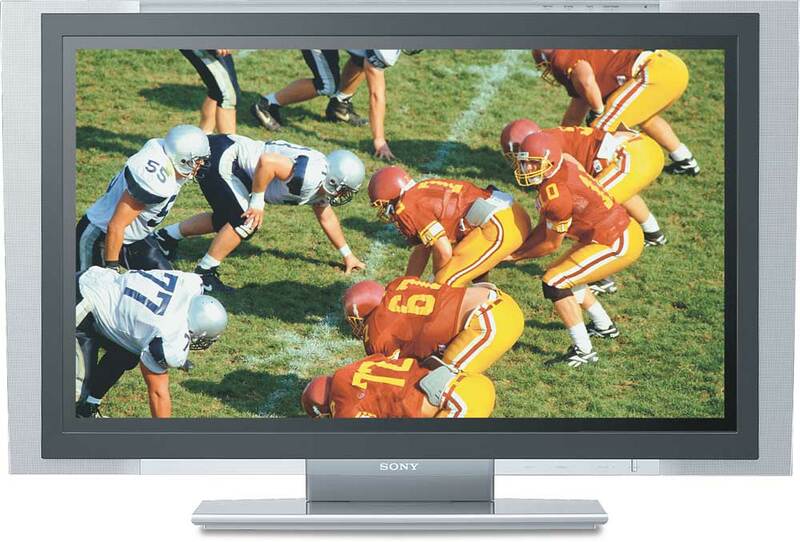 The LC-37D7U's native resolution of 1,366x768 is enough to display full 720p HDTV but not every pixel of 1080i; for that you'll need a set with 1080p native resolution, such as the Westinghouse LVM-37W1. The Sharp scales all incoming pictures to fit the available pixels. Both standard and ATSC tuners are on hand to serve up over-the-air analog and high-definition TV. Since this set is Digital Cable Ready with a CableCard slot, you don't necessarily need a cable box to watch digital and HD cable, provided you can pry a CableCard from your cable company's hands. New for this year, Sharp includes the TV Guide electronic program guide, ostensibly so you don't lose out on the programming information ordinarily served up by your cable box. In our experience, and from reports of CNET readers throughout the country, the TV Guide feature seems to function erratically with some digital cable systems, failing to download program information in some cases. We can't say with any certainty whether it will work in your area. Worthwhile features include independent input memories, color-temperature controls, and a full suite of color controls, which Sharp refers to as the Color Management System (CMS). Though somewhat effective, CMS is pretty complicated, even for advanced users. Aspect-ratio options number four: Side Bar (displays 4:3 sources properly), S. Stretch (for 4:3 sources; stretches the sides more than the center to fill the screen), Zoom (crops the top and bottom to fill the screen width), and Stretch (stretches program material evenly to fill the screen). Unfortunately, with high-def sources, you can't change aspect ratio at all. Inputs are extensive and include two high-bandwidth component, one S-Video, two composite, three coaxial (one cable and two antenna), one HDMI, one RGB PC, and a pair of FireWire terminals that can be used to connect compatible D-VHS, Blu-ray, and hard drive recorders. There's also an A/V output with S-Video, along with one optical digital audio output. The set's out-of-the-box image was definitely superior to that of most LCDs on the market. With A/V mode set to Movie and the color-temperature control set to low, the color temperature came very close to ideal on darker material and somewhat redder in bright areas. This left whites with a slight reddish-yellow cast that was noticeable in all program material but lent a decidedly filmlike look compared to the usual extremely blue cast found in so many TVs. We were unable to conduct a proper calibration prior to press time, but we were able to adjust some of the user controls to improve the image. For example, the color decoder evinced a red push that we were able to tame using the aforementioned CMS. And the primary colors, though slightly orangey in the reds, were also brought nicely into line with the user menu controls. There's a reason we've been saying "for an LCD." 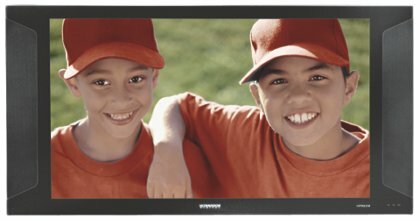 Since this 37-inch flat-panel LCD is the same size as competing plasma sets such as the Panasonic TH-37PX50U yet costs a good deal more, it's difficult to recommend for home-theater applications. 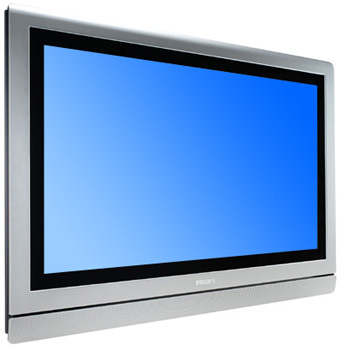 Although we haven't yet reviewed the Panasonic, the company's track record and that of plasma in general would indicate that, despite the Sharp's strengths, plasma is still superior to LCD in image quality. If you're going to be viewing in a brightly lit room, however, then the LC-37D7U is the superior choice.